Sohail Hayat celebrates his innings of 174 not out for Peterborough Town seconds. There were some huge individual scores recorded last weekend. Hong Kong international Courtney Kruger smacked an unbeaten 202 for Bourne seconds to set up a big win over bottom South Lincs Premier Division club Welby Cavaliers. South African born Kruger has recently joined Bourne. Stuart Dockerill claimed career best figures of 7-12 for Castor against Uppingham. There were some big tons throughout the Rutland League competition last Sunday (April 26). 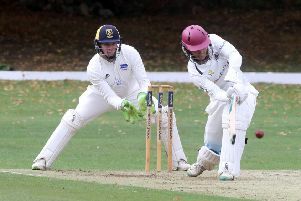 Leading the way was Sohail Hayat who smacked a career best 174 in Peterborough Town seconds’ massive win over Ufford Park seconds in Division Four, while Matthew Rose smashed eight sixes and 16 fours in an innings of 142 not out for Division Two frontrunners Market Deeping against Stamford. And Sam Evison (138) bossed Bourne’s Division One win over Wisbech. Scott Howard struck a career best 140 not out as Peterborough Town thrashed Great Houghton by 142 runs in Northants Division Two. Howard clubbed 15 fours and three sixes in a knock that occupied just 116 balls. Danyaal Iqbal (62) and Sohail Hayat (52no) also scored well as Town posted a formidable 287-4 in their 50 overs. Emerging seamer Stuart Dockerill claimed a career best 7-12 as Castor bowled Uppingham out for 30 in under 13 overs in a Rutland Division Two game.